They 'met' on a matrimonial site and wed in a jungle... See how Aastha and Atirek pulled off a fun wedding at The Riverview Retreat in Uttarakhand's Corbett National Park. Our series, Featured Weddings brings you wonderful moments from weddings held at the finest venues across different cities. Here, bride Aastha tells us all about how she met her husband Atirek and their wedding celebrations at The Riverview Retreat in the Corbett Park in Uttarakhand. "I am an advertising professional who is currently on a break from corporate life in order to enjoy marital bliss. My husband Atirek is a businessman who has his own roofing and building solutions company. After many heart-wrenching experiences of failed dates, formal meetings and useless conversations with prospective grooms, I 'met' Atirek on a matrimonial website. It may sound cliched, but surprisingly we clicked from the start!" "There was never a formal proposal from his side, but I knew we were quite sure about each other early on. We had almost made up our minds about each other after just chatting on the phone for three days. We met for the first time on the fourth day and he requested me to pick a venue. And as the saying goes, 'Well begun is half done'! I picked Rose Cafe in Saket for our first meeting - and it was perfect! We hardly talked when we met as we had done enough of that on the phone. Rather, we stared at each other as we could not take our eyes off each other. We bonded like old buddies and there was no uncomfortable or awkward vibe between us. The atmosphere of the Rose Cafe was very serene and both of us were dressed casually which added to that air of informal bonding between us. At one point, Atirek looked into my eyes, held my hands and said 'I love you!' Well, I did want to hear those three all-important words, but was not expecting to do so this early into our relationship. I responded positively to his sentiment and we spent the whole day together." "We were sure from the beginning that we wanted an intimate wedding. Our guest list comprised around 200 people, and that's not too big a number for a Punjabi wedding. Our wedding planning took around three months, and Atirek and I managed every detail and execution. We were supported by our families who helped us pull off our dream nuptials." 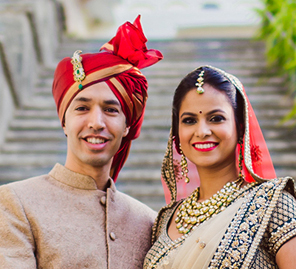 "Atirek and I wanted an unconventional wedding away from the hustle and bustle of a typical Punjabi wedding in New Delhi. We researched destinations close to the capital that were convenient to travel to, yet far away from all the chaos and madness. I recalled my dad telling me a few years ago that he would get me married at the Corbett National Park in Uttarakhand. Back then, the idea of getting married in the middle of a jungle seemed bizarre and upsetting, and I would get mad at him. However, the thought of getting wed in the wilderness seemed exotic. So we visited Corbett National Park after checking out nearby places like Manesar, Jaipur and Karnal. Once we saw The Riverview Retreat in the park, we were convinced it was the venue for our dream wedding." 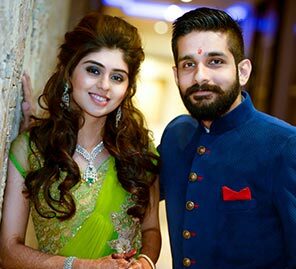 "We had three main wedding functions - the first one was the 'bhajan sandhya' which was held in our hometown of Ghaziabad. The second one was the 'sagan' ceremony followed by the wedding, both of which were held outstation at the Corbett National Park. We kept the decor minimal at these two functions as we wanted our guests to focus on the ceremonies and have fun! We had colourful birdcages adding pops of colour to the venue." 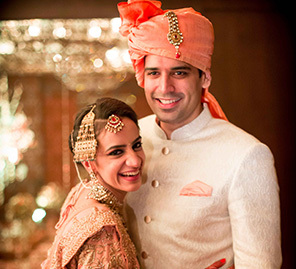 "Our wedding trousseau included ensembles that looked like they were designer outfits despite them not being from top labels. We carefully picked exclusive pieces at the most competitive prices." "For the 'bhajan sandhya', I wore a smart asymmetrical hot pink 'anarkali' suit with an orange Banarsi patiala salwar and a heavy gold dupatta. The suit was heavily embroidered on the back with 'zardosi' and 'resham' work. Atirek wore a orange yellow brocade kurta pyjama from Manyavar which was teamed with a pure silk stole." "For the 'sagan' ceremony, we went the Western route. I picked a gold beige gown from Frontier Raas, and he wore a sharply cut black tuxedo from Blackberries." "We knew our wedding ensembles had to be something special... and I was sure I did not want any red, pink or orange. I wanted something unusual but classy, something a bit different from the usual bridal colours. I searched everywhere - from designers stores to malls. I got lucky when I visited Chandni Chowk and browsed the Asiana Couture store there which has a very exclusive collection. "I picked a heavily embroidered midnight blue lehenga with ornate 'zardosi' and 'resham' thread work which was paired with a peach dupatta. The lehenga was resplendent with floral motifs and vase designs all along the hem. I wore a 'polki' necklace from Bikaner's Krishan Lal Jewellers & Sons, alongside a 'maang tikka' and elegant dangling earrings." I designed Atirek's wedding attire! I procured the blue raw silk material from Chandi Chowk, and had it embellished with 'kundan' work buttons. This outfit was paired with a pink Banarsi georgette dupatta with a blue 'dubka' work border." Bride: "After six months of exhausting wedding preparations, when the big day finally arrived, I realised I was missing Atirek in all the madness as I did not see him or get to talk to him. The other memorable moment took place on our engagement day when I saw him in a tuxedo. He was waiting for me, and when I came closer he took my hand and escorted me to the stage. We were so happy sitting next to each other that we could not stop smiling!" Groom: "Aastha had planned some surprise for me. She made a set of six small cards with personal messages which were handed to me over two days at different times. I must say each card was perfectly times and contained messages that were just right. My favourite card was the last one which was handed to me by her best friend right before her entrance at the wedding venue. It read 'Hold your breath! Here comes your happily ever after...' I read it, looked up, and there she was, the most beautiful girl I have ever known. That moment was truly memorable for me." "Do your best to plan things yourself, exhaust yourself completely and try and do things together with your partner. But when the day comes, don't panic about arrangements or any hiccups. Just enjoy the moments and have the best time of your life. Believe me, those two or three days will be akin to a roller coaster ride and will whiz by in the blink of an eye." "We didn't hire any planner as Atirek and I made a great team. The wedding was all planned by us. We spoke to around 50 people before zooming in on the vendors. For my make-up, I chose Atul Chauhan who worked magic with his skills! Our wedding photographer was Hitesh Shivanani. I had seen his work for a friend's wedding and had liked his approach."